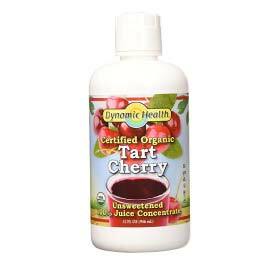 Dynamic Health Certified Organic Tart Cherry Juice Concentrate contains 100% organic tart cherry juice concentrate. According to the majority of the reviews, this juice tastes great and is easy to drink daily. This juice met and exceeded most buyers’ expectations, especially in aiding post workout and exercise recovery. The juice provided a reduction in leg pain as mentioned by some purchasers. Unquestionably one of the most well-known Tart cherry juice concentrates on the market. The 100% organic formula makes it easy to trust for must health conscious users. Dynamic Health Certified Organic Tart Cherry Juice Concentrate can be found reasonably priced at most health food stores, vitamin shops, and online stores. Its quality, effectiveness, and ingredients are worth every penny as said by the majority of buyers. Tart cherry juice is the juice of choice for those in need of a little help with joint pain, muscle pain, sleep, high blood pressure, blood sugar, gout, immune system health, and vitality. However, studies show mixed results for a number of the touted health benefits. Tart cherry juice is high in anthocyanins, a type of powerful anti-oxidant flavonoid. Studies show that tart cherries have been shown to also have anti-inflammatory effects. Studies show that taking tart cherry juice improved althetic performance and helped to reduce muscle pain and soreness after workouts. Improve sleep and sleep quality – Tart cherries naturally contain a small amount of melatonin (which is the sleep-regulation hormone) which may help improve sleep quality and insomnia. Improved recovery of sprains and strains due to exercise related injuries. May also help with reducing pain. Osteoarthritis – A study showed that people who took tart cherry reported reduced joint pain, tenderness, and disability. A daily intake equivalent to 100 to 120 cherries or at least 80 mg anthocyanins is recommended for most optimal health benefits of tart cherry juice. This is usually equivalent to 16 to 24 ounces of tart cherry juice, or one ounce of tart cherry concentrate. Forming a habit of drinking tart cherry juice is also advised for most optimal health benefits. You should understand that most tart cherry juices do contain alot of sugar, 10-25grams of sugar typically. Be careful of drinking to many glasses of tart cherry juice because the increased sugar content could cause more issues for you. Side effects to tart cherry juice are very limited. Unless you are the handful of people who are allergic to cherries, its uncommon to have any side-effects to taking or drinking tart cherry juice. Tart cherry juice and concentrates do contain sugar which could interfere with diet restrictions or medical conditions. Can be replaced with tart cherry exact supplements which usually contain no sugar. One glass a day is usually enough to benefit from tart cherry juice, espeically for gout. If you find that you’re experience side-effects of any kind, stop taking it and consult a healthcare provider at your next visit.